The emergence of ‘superstar’ firms that achieve vastly better returns on invested capital have led to concern that some sectors are too concentrated. The column argues that this difference in returns can be accounted for by better measurement of intangible capital. These firms may not be exercising market power in ways that harm consumers in the short run, but policymakers should ensure that markets remain contestable. Recently, much attention has been paid to the emergence of 'superstar' firms that are pulling away from the rest of the economy. A brief by the US Council of Economic Advisors (2016) contains a striking visual of this development (Figure 1). 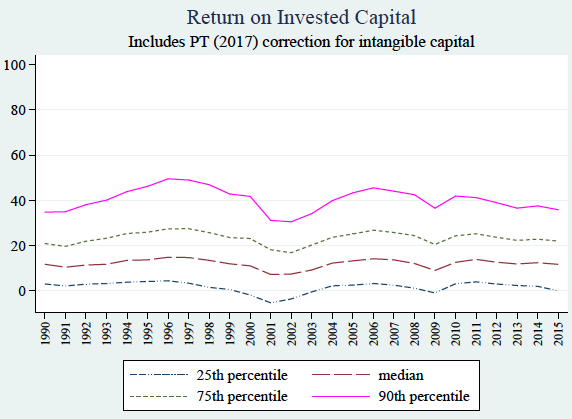 Figure 1 shows that the return on invested capital (ROIC) is becoming more unequal, with superstar firms (90th percentile) pulling away. Other manifestations of this phenomenon have been noted by Kurz (2017), Autor et al. (2017), and Van Reenen and Patterson (2017), among others. Note: The return on invested capital definition is based on Koller et al. (2015), and the data presented here are updated and augmented versions of the figures presented in Chapter 6 of that volume. The McKinsey data include McKinsey analysis of Standard & Poor's data and exclude financial firms from the analysis because of the practical complexities of computing returns on invested capital for such firms. Source: Council of Economic Advisors. Many researchers have argued that this is caused by increases in concentration and market power in the US economy. Grullon et al. (2017) showed an increase in concentration in US industries in the last two decades. De Loecker and Eeckhout (2017) demonstrated an increase in market power of firms as measured by mark-ups. Baker and Salop (2016) directly linked a decline in anti-trust statutes’ enforcement to increases in concentration and rising inequality in the US. Barkai (2017) and Autor et al. (2017) linked concentrated winner-take-all markets with the fall in the labour share in the US, to explain the rise of the superstar firms. In a recent paper (Ayyagari et al. 2018), we investigate whether this rise in ROIC and mark-ups is related to the mismeasurement of intangible capital. Using data on listed firms in the US, we were able to show that, when capital stock is adjusted for intangible capital, both the dispersion and the rise in ROIC disappear. The evidence that superstar firms have higher mark-ups than other firms, or are limiting output compared to these firms, is limited. Economists have long studied the mismeasurement of intangible capital, in particular R&D capital and organisational capital, for example Grabowski and Mueller (1978), Hirschey (1982), and Corrado et al. (2009).1 We follow the most recent approach in Peters and Taylor (2017), adjusting standard financial statements for firm-level stocks and flows of R&D and organisational capital. Because some expenditures (R&D expenses, for example) are now treated as investment in intellectual capital, the firm’s capital stock – the denominator in the ROIC calculation – increases. Because these expenditures are now treated as investment, they are no longer deducted from revenues, thereby increasing firm income. Because the firm’s capital stock is now larger, the total amount depreciated each year increases, depressing firm income. These last two effects adjust the numerator of the ROIC calculation. Source: Ayyagari et al. (2018). Figure 2 shows that, once we adjust for intangible capital, there is no evidence of an increasing gap between superstar firms and others. Furthermore, the rise in inequality in Figure 1 occurred mostly in industries that rely on complex problem-solving, non-routine cognitive analytical skills, and low routine manual skills. Once we adjust for intangible capital, we no longer see a run-up in ROIC, even in these industries. It is likely that the run-up seen by previous researchers was due to mis-measurement of capital. From a policy perspective it is reassuring if there is no increase in firm inequality. But this does not mean that market power is irrelevant. In particular, it is possible that the returns of superstar firms are still driven by market power. This concern is relevant to the use of firm-level mark-ups to measure the increase in market power over time (De Loecker and Eeckhout 2017, and Traina 2018). This approach relies on the insight that, for a given stock of capital, the firm will adjust its variable inputs, and hence its mark-ups, in response to industry competition and the elasticity of output to the variable input. Given industry-level estimates of the elasticity of output, and firm-level estimates in productivity, revenues and costs, we can calculate each firm’s mark-up each year. In calculating mark-ups, it is important to correctly characterise the stock of capital and distinguish between investment expenditures and expenditures that contribute to variable costs. De Loecker and Eeckhout (2017) assume that the only variable costs are the cost of goods sold (COGS), while Traina (2018) assumes that all operating expenses (OPEX) are variable costs. 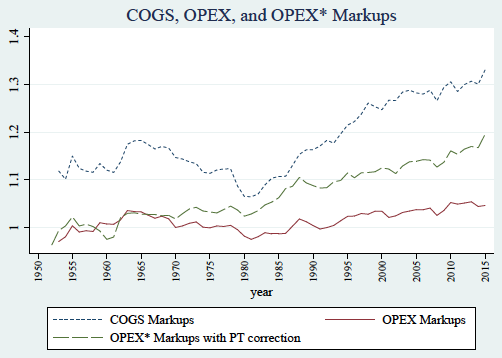 When we disentangle the effect of investment in intellectual and organisational capital from variable costs of production, following the approach in Peters and Taylor (2017), we find that mark-ups (OPEX with PT correction in Figure 3) have been increasing over time for US listed firms, but at a lower rate than reported by De Loecker and Eeckhout (2017). Regressions show a positive relation between ROIC and mark-ups, so that in general firms with higher mark-ups (and hence pricing power) realise higher returns, the effect is not very strong. This is illustrated in Figure 4, which is a histogram of mark-ups and the ROIC realised for each level of mark-up. 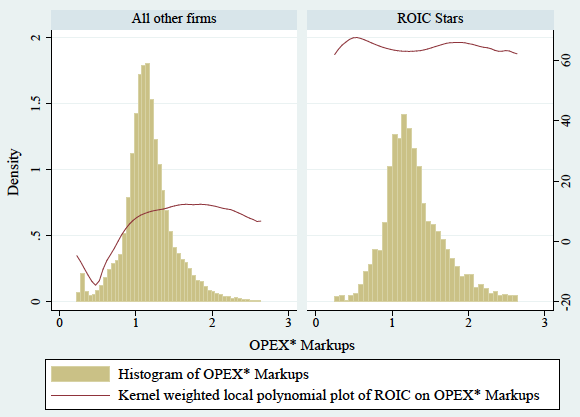 In the left panel, we see both a large variation of mark-ups, and a positive relation between ROIC and mark-ups for non-star firms. In the right panel, while superstar firms have on average slightly higher mark-ups, the difference between the superstar firms and the others is relatively small. superstar firms realise much higher returns at all levels of mark-up. Thus, high mark-ups are not necessarily a first-order determinant of high ROIC. Figure 5 explains this puzzle. It tracks the relationship between sales/invested capital and mark-ups for superstar firms and others. 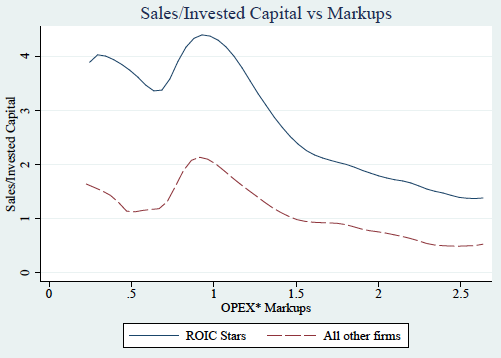 At high mark-ups all firms reduce sales to invested capital, but superstar firms consistently produce more than other firms with the same mark-up. Together with Figure 4, which shows that a large fraction of superstar firms have relatively low mark-ups, this suggests that firms do not make high profits by restricting output. They are as likely to have high productivity, or to be adopting a high output strategy. In our paper, we present regression evidence to support the conclusions drawn from the figures and discuss alternative measurement and modelling assumptions in our computations. Overall, after adjusting for intellectual and organisational capital, we find little evidence that there is increasing inequality across listed firms in the US. Pricing power, as measured by mark-ups, predicts higher ROIC across firms. However, both the distribution of mark-ups and the relatively higher output for a given mark-up for superstar firms suggest that changes in mark-ups due to a reduction in competition are not the prime determinants of superstar firm status. How can we reconcile these findings with the general sense that superstar firms are creating supernormal value for their investors over time, and in the process, disrupting industries? The debate on superstar firms often focuses on a very small number of firms, such as Facebook, Amazon, Netflix, and Alphabet (the parent company of Google) – jointly called the FANG stocks – and a few others. The statistical analysis used here is not optimised for such small sub-samples. However, there may be a deeper reason. Amazon’s business model prioritised growth over profits to achieve scale. Thus, superstar firms may not be exercising market power in ways that harm consumers in the short run, or that would be picked up by current ways to measure market power. If this is the case, the critical concern for policy is to ensure that markets remain contestable and that entrants with new technologies can challenge current market leaders. In particular, the danger is that incumbent firms may simply buy new technologies that have the potential challenge their future dominance. In their study of takeovers in the pharmaceutical industry, Cunningham et al. (2018) provide compelling evidence that successful incumbent pharmaceutical firms acquire potential rivals with competing drugs and terminate targets’ drug development. Autor, D H, D Dorn, L Katz, C Patterson, and J Van Reenen (2017), "The Fall of the Labor Share and the Rise of Star Firms", NBER working paper 23396. Ayyagari, M, A Demirguc-Kunt and V Maksimovic (2018), “Who are America's star firms?”, World Bank Policy Research Working Paper WPS8534. Barkai, S (2017), “Declining Labor and Capital Shares”, Job market paper. Bartlett, R and F Partnoy (2018) “The Misuse of Tobin’s Q”, UC Berkeley Public Law research paper. 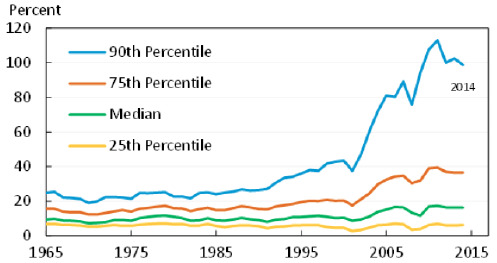 Corrado, C, C Hulten, D Sichel (2009), "Intangible capital and US economic growth", Review of Income and Wealth 55: 661–685. Council of Economic Advisors (CEA) (2016), “Benefits of Competition and Indicators of Market Power”, Issue brief. Crouzet, N and J Eberly (2018), "Intangibles, investment, and efficiency", AEA Papers and Proceedings. Cunningham C, F Ederer, and S Ma (2018), "Killer Acquisitions", unpublished working paper, Yale University. Damodaran, A (2018), "Amazon: Glimpses of Shoeless Joe?" Musing on Markets blog, 26 April. De Loecker, J and J Eeckhout (2017), “The rise of market power and the macroeconomicImplications”, NBER working paper 23687. De Loecker, J and F Warzynski (2012), “Mark-ups and firm-level export status”, American Economic Review 102(6): 2437–2471. Eisfeldt, A L, D Papanikolaou (2013), “Organization capital and the cross section of expected returns”, Journal of Finance 58: 1365–1406. Eisfeldt, A L, D Papanikolaou (2014), “The value and ownership of intangible capital”, American Economic Review: Papers and Proceedings 104: 1–8. Falato, A, D Kadyrzhanova, and J W Sim (2013), “Rising intangible capital, shrinking debt capacity, and the US corporate savings glut”, Finance and Economics Discussion Series 2013–67, Board of Governors of the Federal Reserve System. Furman, J and P Orszag (2015), "A Firm-Level Perspective on the Role of Rents in the Rise in Inequality", presentation at “A Just Society”, centennial event in honour of Joseph Stiglitz at Columbia University. Grabowski, H G and D C Mueller (1978), "Industrial Research and Development, Intangible Capital Stocks, and Firm Profit Rates", Bell Journal of Economics 9: 328-43. Grullon, G, Y Larkin, and R Michaely (2017), “Are US IndustriesBecoming More Concentrated?” Working paper. Hirschey, M (1982), "Intangible Capital Aspects of Advertising and R&D Expenditures", Journal of Industrial Economics 30: 375-390. Kurz, M (2017), “On the Formation of Capital and Wealth”, Stanford Institute for Economic Policy Research (SIEPR) working paper. Lev, B, S Radhakrishnan (2005), "The valuation of organization capital", in: C Corrado, J Haltiwanger, D Sichel (eds), Measuring Capital in the New Economy, University of Chicago Press: 73–110. Peters, R H and L A Taylor (2017), "Intangible capital and the investment-q relation", Journal of Financial Economics 123(2): 251-272. Traina, J (2018), “Is Aggregate Market Power Increasing? Production Trends Using Financial Statements”, Stigler Center working paper 17. Van Reenen, J and C Patterson (2017), “The Rise of Star Firms Has Been Better for Investors than for Employees”, Harvard Business Review. Other recent references include Lev and Radhakrishnan (2005), Corrado et al. (2009), Eisfeldt and Papanikolaou (2013, 2014), and Falato et al. (2013). Also see Bartlett and Patnoy (2018) for a detailed review of the literature on measurement and use of Tobin’s q as a proxy for firm value.